Si un prix de location est mentionné dans l'annonce, il peut ne pas être 100% correct, puisque le système de tarification ne permettra pas plusieurs prix pour une période ... S'il vous plaît contactez-moi pour le prix correct. Le loyer du 1er janvier au 24 février 2020 17. 000 $ + 200 frais de nettoyage. Honda Clsssic 24 mars - 1 ou 2 mars 2020 6. 000 + 200 frais de nettoyage. Profitez de vos vacances dans les confins PGA National, une prestigieuse communauté fermée située à Palm Beach Gardens, FL. Notre maison est de 2700 pieds carrés sous air, avec vue sur le golf et piscine privée. Notre maison a été entièrement rénovée et rénovée en 2011, offrant une grande nouvelle cuisine avec salle à manger, salon avec 50 'TV à écran plat, 4 chambres et 3 salles de bain complètes, une avec baignoire. La chambre principale dispose d'un lit king size, d'une télévision à écran plat 37 ', d'un dressing et d'une immense salle de bains. Deux des chambres ont des lits king size et une avec un lit queen size. Nouvelle cuisine, salles de bains, les tapis, la peinture et de nouveaux meubles ont été effectués de 2011. La cuisine est entièrement équipée, avec des appareils. Nous avons une grande terrasse / véranda avec mobilier de salle à manger, vue sur le golf, grande piscine privée (43 pieds de long) qui est chauffée avec un grand système solaire. La cour arrière est située dans le sud, donc il y a du soleil toute la journée. Avant de nous contacter, veuillez consulter notre calendrier pour connaître les dates souhaitées. En Floride, vous apprécierez certains des plus grands golfs des États-Unis. PGA National a été l'hôte de la Classique Honda, la Ryder Cup et le Championnat de la PGA. Notre maison est à seulement 10 minutes de la plage, les jardins Mall (Featuring Saks, Nordstrom, Macy et Bloomingdale), de nombreux restaurants dans toutes les gammes de prix et beaucoup plus. 15 minutes de Palm Beach et de City Place, Worth Avenue et Kravitz Center for the Performing Arts. Only15 minutes de West Palm Beach Airport. Beautiful property. Easy owner to deal with. We'll be staying here again soon. We rented this house for 1 week in July and it was perfect. 6 of us stayed in the house and it was more than enough room for everyone. Everything in the house was very modern and clean. The beds were the most comfortable I have ever slept on. The pool was the highlight with all of the heat and sunshine. We basically lived on the back patio. AC worked fabulously inside. It felt very homey. I plan on renting this house again for future trips down to Florida. Rolf was so helpful with giving directions and local tips on places to eat and have fun. The kitchen and grill were life savers! Tons of room for groceries and we loved how he provided the basics with spices and condiments. Even though it was in a giant neighborhood, we had full privacy the entire time. This was the perfect vacation home and I recommend renting from Rolf if anyone wants to go to Florida for a vacation! The Master Bedroom was amazing, and the beds very comfortable all around. The pool could have been slightly warmer, but I guess that's managable upon request (we didn't though). Only downside was that we didn't have a phone number to reach you on for emergencies, this should be provided in contract for future rentals. Otherwise the view was obviously excellent, only regret was that we where not able to play the courses (was informed by Rolf prior to arrival). Again thank you for a wonderful week, I would definately consider your house again if ever in the area. Beautiful home in wonderful community! Excellent accommodation! Outdoor living was beautiful! Pool was a huge plus with children! Could not have been more pleased with everything! The property was lovely! The house was gorgeous, with every detail. Very spacious and a comfortable. We had an excellent experience with this property and the owner. The business transactions were easy and efficient. This house was beautiful and it is situated in a great location for shopping, dining out and easy access to highways and interstates. The pool was refreshing and stayed cool even on the hottest days! I highly recommend this property. I stayed at this gorgeous home for 1 month in April-May, 2016. 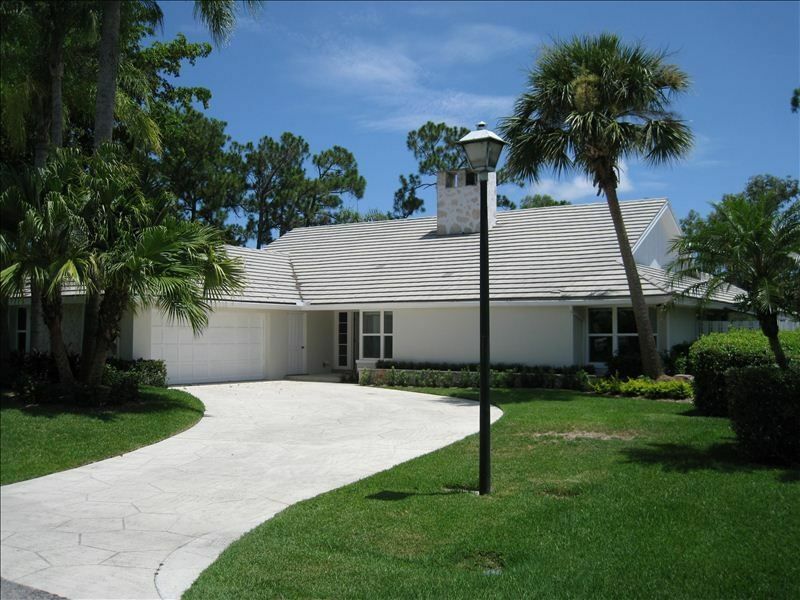 The home is located on a golf course in a gated community at the PGA Resort. It has every possible amenity. It's beautifully decorated, comes with a well-stocked pantry and is IMMACULATE. The screened-in swimming pool and huge lanai area was the center of our activities everyday. The pool water was delightfully warm but also refreshing. Because of the home's location, the pool receives the sunshine all day long. And the weather was gorgeous.....only 1 day of rain in our 31 day stay. The bedrooms are situated so that everyone has total privacy but are still close enough to the huge living room. The living room fireplace was a classy touch. There are tons of great restaurants in the area but Rocco's Tacos and Paddy Macs (an Irish pub) were 2 of our favorites. Plus, a Publix grocery store, fast food restaurants, a gas station and a wine and spirits store are all located about 5 minutes away. Rolf (the owner) was attentive and quickly responded to my questions and requests. I would definitely rent this home again. Thank you for everything Rolf. At the moment we don't wan't to split Dec to much. The rent for 16 Dec - 31 Dec (1 Jan) is 5.500$ + 200$ cleaning fee. The rent for 16 Dec - 26 Dec (1 Jan) is 5.000$ + 200$ cleaning fee. It might be possible to stay a few more days into Jan, the rent is then 270$/night in Januari.The prices above are only examples and not 100% correct, since the pricing system will not allow multiple pricing for a period. Rates might change. Please contact me for more precise pricing. Prices will vary depending on different factors, such as: how busy the months is and/or what weekday you're checking in/out, when the next guest is checking in/out Contact me for last minute booking. Standard Rates May - Dec. Weekly: 1800-2200$ Monthly: 3500-7500 VRBO/Homeaway/Vacation rental is not set up for safepayment or credit cards to my country (Sweden), so I can not accept credit cards or safepayment. For more info about this and why Sweden is not part of there payment system, please contact the webside.